Great my granddaughters loved this quilt. 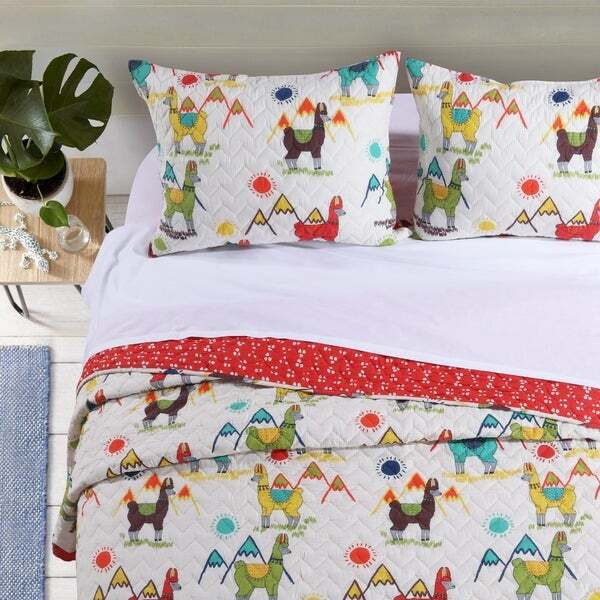 Transport yourself to the sunny highlands of Peru with the Cuzco bedding set. Llamas and alpacas dressed in finery and brightly colored fleece stand among majestic mountain peaks. This exotic set features chevron quilting and reverses to a coordinate llama-hoof print for two looks in one. Oversized for better coverage on today's deeper mattresses. Prewashed with extra softener for unparalleled comfort. Machine quilted with fabric bound edges for durability and surface interest. Quilt set comes with quilt and two pillow shams (one sham per Twin set). Dimensions: Twin set includes one 68x88" quilt plus one 20x26" pillow sham, Full/Queen set includes one 90x90" quilt plus two 20x26" pillow shams, King set includes one 105x95" quilt plus two 20x36" pillow shams. Dimensions +/- 2". 100% Microfiber polyester face and back; 100% Polyester fill. Machine Wash. Imported. My granddaughter and I both love the comforter set.Absouluty gorgeous. The cutest comforter, nice quality, washes well and the colors are vibrant. I was very happy to find this adorable quilt and the price was super reasonable. The colors were the same as the picture and the quilt feels hefty. This might be for a child but oh well I’m in my 20s and I love it! i love the quilt. Very soft only complaint is that it makes lint balls quick and i have to shave the quilt. My grandaughter and I love llamas and alpacas and I love the bright colors in this quilt.However There was another I really liked also but I could not determine the true color.It appeared to be in the salmon range but I was afraid that it would be too pink. I might order also and see which I like best.